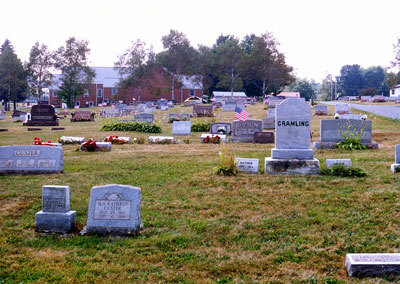 To access this cemetery coming in from Johnstown, PA, leave Johnstown by way of the top of Main Street which becomes the Frankstown Road. Follow the Frankstown Road until you come to Rager's Corner which is where Frankstown Road, Solomon Run Road, Mount Hope Road, Ragers Hill Road and Clapboard Run all intersect. It is not marked Rager's Corner, just known as that. At the intersection, take a left onto the Mount Hope Road. Follow that until you come to the United Methodist Church on the left. Pass it and you will be at the cemetery. If you are coming in from South Fork follow SR 180, which is Ragers Hill Road, until you come to the Rager's Corner intersetion. Take a right onto Mount Hope Road and proceed until you arrive at the United Methodist Church and pass it. You are then at the cemetery.